This power supply gives you 5V on one side of the board and 3.3V on the other side or you could have 5V on both sides or 3.3V on both sides which makes it perfect for mixed voltage projects. Power to the card can be supplied by a USB-A Cable or a 6 - 12 VDC Power Supply. These are great to keep on hand for a simple way of getting power to projects! 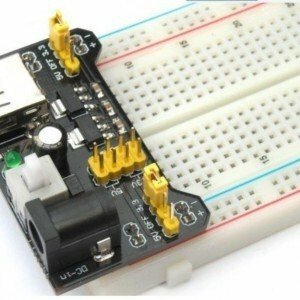 Note breadboard is not included but we have it available.